I’ve been catching up with Great British Menu since my return, and as a daily 30 minute televisual food fix it’s quite good fun. Ooh! 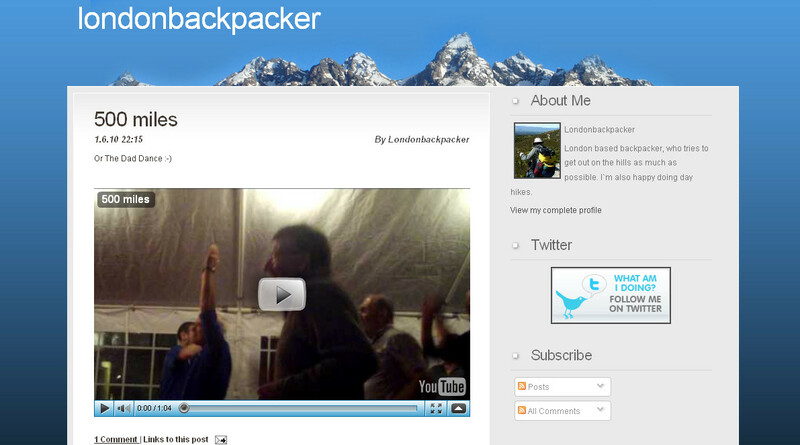 More catching up has revealed video evidence, on George’s Londonbackpacker blog, of the last dance at the Moorfield Hotel in Braemar on the middle Saturday of the Challenge. Save the George & Dragon in Garrigill! The wonderful pub in Garrigill -- closed! 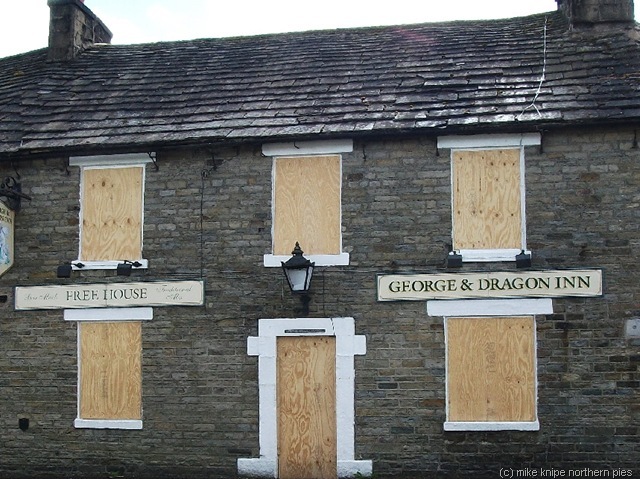 Catching up with blogs this morning, I’ve just read on Mike Knipe‘s that the wonderful George & Dragon pub in Garrigill is currently closed. (I’ve stolen the piccy from Mike’s site: I hope he doesn’t mind.) Apparently locals are getting together to try to work out whether they can afford to save it. Everybody who’s done the Pennine Way will know this wonderful place. It wasn’t open the first time I was there, as I was there at the wrong time of day, but when I did most of the PW again in March 2008 it was open, and it was one of the most comfy and hospitable pubs I’ve ever had the great pleasure to fall scruffily into, after a long day on the hills. No makeovers had taken place, and I settled happily into a seat and fell into conversation with some blokes I’d seen earlier in the day as I was crawling, on hands and knees, up Cross Fell in gale force winds, through thick snow. I had to leave an hour later to find somewhere to camp, but the memory of that golden hour shines bright in the trove of piggly backpacking treasured memories. There’s a petition here that can be signed. I don’t know whether the pub can be saved, but surely it’s worth a signature in the hope that something can be done. I was upstairs about half an hour ago, drooling over a cookery programme on the television, when there was what sounded like a sudden wild thumping on the front door. I don’t generally answer it to wild thumping, but a minute or so later the door bell rang and so I went down. On the doorstep was a Community Support Officer. Um… He asked whether the car parked outside was mine, and I confirmed that it was. He then asked whether I’d been to the Tesco Express in Albert Road yesterday. I wasn’t sure, because I’ve no idea where Albert Road is. I did have a vague recollection of visiting a Tesco Express the day before, though. It turned out that I *had* gone to the Tesco Express, on the way to the pet shop to buy some new chews for Piglet, and had forgotten to pay for my petrol. Eek! I’d gone in and bought some other stuff–including those blasted greenish bananas–which I had paid for, but it seems I’d become distracted by the banana selection process and forgotten about the petrol when I got to the tills, despite having made a mental note of the pump number for once so that I didn’t have to say “That one in the corner behind the green Volvo next to the black Alfa Romeo” etc. You are currently browsing the Peewiglet's Plog blog archives for June, 2010.